Moifaa wasn’t the prettiest horse but he had a great temperament. Ask almost anybody to name the world’s greatest steeplechase and most will say “The Grand National.” What is it about this four-mile four-furlong (two and a quarter mile) race that has captured the hearts, minds and imaginations of race enthusiasts since its inception in 1839 and remains the “one to win” in racing circles? Little known jockeys and horses have become overnight sensations, and sure winners have fallen – literally – by the wayside as the 30-jump race that attracts over 154,000 spectators is never a foregone conclusion. The Grand National has seen more than its share of thrills, spills and stories so unreal that they are hard to fathom. One of the best loved stories in Grand National history deals with Moifaa, an ugly duckling who made headlines even before the race was run and eventually became a King’s favourite. Would the Real Moifaa Please Stand Up? The tale of Moifaa weaves truth and fiction into a sensational story that begins in New Zealand. Moifaa wasn’t a horse that attracted attention thanks to great looks. He was tall at 17 hands with a big head and some say his head and shoulders were like those on a camel. However, his ability to jump made him a winner in numerous races with his owner/jockey Alf Ellingham; together they won 11 of 16 races in his first season, including the prestigious “Great Northern” at Ellerslie in Auckland. A wealthy businessman, Spencer Gollan, bought the horse for his daughter when he saw how well the horse jumped paddock fences when Moifaa was startled by an earthquake. Initially the daughter refused to ride the, “ugly looking bloody thing,” but his pleasant temperament won her over. Gollan’s friend, the Prince of Wales (later to become King Edward VII) had won the Grand National with his horse Ambush II in 1900 and Gollan embarked on a similar quest by entering Moifaa in the 1904 Grand National. The next roadblock was getting the horse to England, a major undertaking in those days of steam ships and primitive equine shipping methods. The ship left New Zealand and almost got to Liverpool before a storm blew up in the Irish Sea. The captain, knowing that his ship was going down, opened Moifaa’s stall door and let him roam on the deck and later presumed him dead. A few days after, a fishing boat pulled into a remote island and found an exhausted horse at the water’s edge, loaded him on their boat and made for England. The story gained momentum as reporters all over the globe assumed that the horse was Moifaa, the horse who swam 50 miles to safety and later won the 1904 Grand National. Aintree 1843 by William Tasker (1808 – 1852). Now, for the truth. There were actually two ships that left for England at the same time both with horses aboard bound for the Grand National: Moifaa and two other horses in one ship and a second ship carrying two horses. Moifaa’s ship actually got to England safely, but the other ship, the S.S Thermopylae, struck a reef off Table Bay on the Cape of Good Hope on January 25th 1901. The ship was sinking but one crew member swam back and was able to free one horse before the ship went to its watery grave taking the second horse Kiora with it, or so he thought. However, Kiora was later found exhausted but alive and continued on his way to England and in 1904 he did run in the Grand National against Moifaa. Moifaa didn’t shine in his first three races in England and his jockey for the Grand National, Ben Ellis, was passed over in favour of a journeyman jockey Arthur Birch. 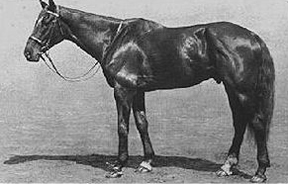 Moifaa was racing against Ambush II, King Edward VII’s horse and another popular horse Manifesto was making his final appearance at the age of 16. Moifaa was rated at 25/1. The fences that year were bigger than normal but this was a bonus for Moifaa with his height and jumping ability. Inquisitor went down at the fifth fence and Birch gave Moifaa his head and they crashed through the fences leading to the finish. He was challenged at the infamous Becher’s Brook on their second time around by a horse called Detail who was just two lengths behind but he got tripped by a rider less Ambush. Moifaa streaked across the finish line eight lengths ahead. The King was so impressed that he bought Moifaa and the next year the ugly duckling was set to race in the Royal colours. Race day dawned and all who mattered were there in the stands including the King with his “friend” Alice Keppel, great grandmother of Camilla Parker Bowles, (Prince Charles’s wife) as his arm candy. Sadly, even the favourites fall and Moifaa went down at Becher’s Brook on his second time around and never raced in the Grand National again as he had developed breathing issues. The King gave Moifaa to his friend Colonel Brocklehurst and Moifaa hunted for many seasons in Leicestershire. The Moifaa trail grows cold at this point, but it is presumed that he lived out the rest of his days nibbling the grass in his Leicestershire paddock, thinking of his home in New Zealand thousands of miles away and his Grand National win.